Here's more from the new line of Color Statement lipsticks from Milani! The company identifies this grouping as "pinks & corals" and I'm so excited to show you all the colors! I am loving so many of these. As with the oranges & reds, there are a variety of finishes here, and each shade is pretty darn bold! Like I said in my last post, these lipsticks don't make my lips feel dry, but at the same time, they're not so slick & emollient that I feel like they're going to slip right off my lips. The staying power is quite good and the formula does contain vitamins A, C & E. Every single shade builds up color instantly on the lips- you don't need to work at it. They are intensely pigmented, so if you like color- keep reading! Some of these shades might be just what you're looking for. For an even more detailed description of the formula, check out my first post. Left to right: Pink Frost, Fruit Punch, Flamingo Pose, Rose Hip, Hot Pink Rage, Flirty Fuchsia, Rose Amour. I think this lipstick has the perfect name. It's one of the frostiest pinks I think I've ever tried. It's extremely metallic and if you are self-conscious about fine lines in your lips, beware of super frosty shades like this, because like a frosty highlight on the face, it'll draw attention to any lines or dryness on the lips. I do like the color though. And if you ever want to tone down a too-frosty lipstick, top it with a creamy gloss. I really like this color! It's a warm, creamy pink that has some brightness but isn't too "in your face" (we'll get to those shades in a minute, haha!) You'll notice the cream formulas in this line are just that- a nice smooth feel with no shimmer. I feel like I run into a lot of colors in this true pink tone, but many of them seem to have at least a slightly frosty edge to them. I love that this one is just full-on color. Who needs a super fun spring and summer lipstick? Wait, I can't believe I wrote that... we're expecting ice and snow here tonight. But still, regardless of the time of year, this is a gorgeous coral pink. It just really makes me think of tropical beverages and warm weather. After I went through all the lipsticks, I put this one back on. I'm kind of infatuated with it since I don't have any shades like this. I have some peachy/salmon colors, but this one still has a lot of pink to it, which I love. Hello!!! Don't you love that even though this picture is slightly out of focus, that pink absolutely pops off the screen?! Wowza. Should I wear this color out and about? It's amazingly bright but it's kind of growing on me! With a simple eye look, I think it could work. I feel like it has a hint of a purple tone to it (just a teeny bit!) but not too much. I've seen some people showing Maybelline Vivids lipsticks in purple-ish tones, and while I don't think I could go there- I do find this color very fun! I found myself laughing at the name of this lipstick :) I'm a little bit washed out in this pic, but this lipstick is still showing up pretty true to color. This matte formula is really close to the creams in this line, but just slightly less shine. This is similar to Rose Hip, but a little warmer and less purple-ish... therefore it seems a little more wearable to me. Maybe I'm just more used to seeing myself in this tone of pink. I love it! OMG. If I had to permanently paint my lips one color... this might be the one I'd choose. I'm in love with this! It's a great berry pink and the vinyl formula means it has just a little more shine than the rest, but no shimmer. I think it just looks so juicy and fresh. I am just thrilled with this color. Well done, Milani! A line of lipsticks wouldn't be complete without a classic Barbie pink! That's what I think of this one as. It's seems to have the same depth/color intensity as Fruit Punch-- but this shade is just cooler in tone. I think Rose Amour really shows that a color doesn't have to be dark to still be really bold and make a statement. I could see myself rocking this color with a charcoal smokey eye. Well, I REALLY like this family of Color Statement lipsticks! Is anyone surprised? My room is painted hot pink! :) The shades have amazing intensity and while it seems like lots of lipsticks in the drugstore contain a lot of shimmer- here you have many rich, creamy options. My favorites are Fruit Punch, Flamingo Pose, Hot Pink Rage, and Flirty Fuchsia. I'm going to work on my comfort level with Rose Hip, but that may become a favorite too! 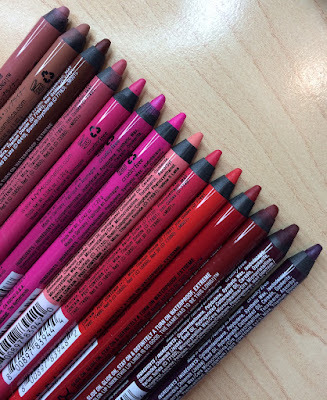 I still have a few lip liners to post about, and if I get some more collections of these to try, I'll continue to post blogs sharing the colors! Had a nice lunch meeting this afternoon that included an amazing greek salad. YUM. Beauty Broadcast Live on Ustream tomorrow- 9am central time!! It's a great time to ask questions and just have some random chit chat! I was talking on the phone with mom about makeup. She informed me that she has created her own BB cream by mixing Rimmel Lasting Finish foundation with her Olay moisturizer. She says she uses it for days when she wants lighter coverage. Good job, Mom! 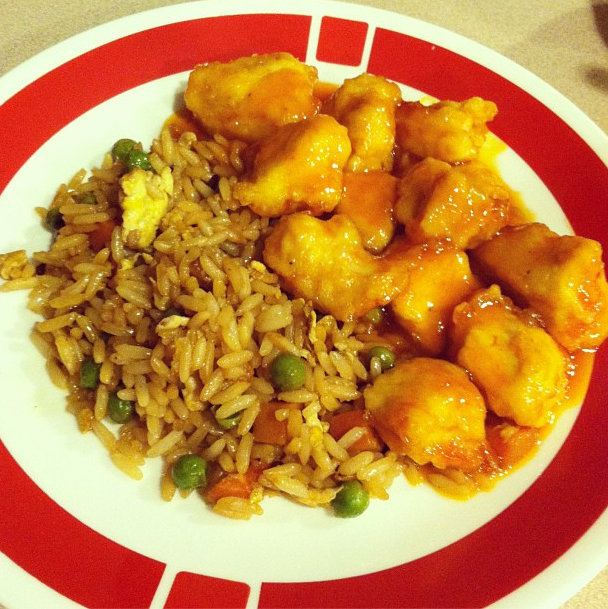 I mentioned yesterday that I was going to attempt this baked sweet & sour chicken recipe that I found on Pinterest. Well, it was a heck of a lot of work, and if I do it again I'll save it for a time when Tyler can help out. There are just so many steps and it could've gone by faster with some extra hands. Plus I used the designated amount of chicken breasts, but apparently mine were too big (the chicken's breasts, not mine LOL), and I had an extra half dish full of chicken. Therefore I had to make extra sweet & sour sauce to put on them. Also made the fried rice (my first time doing that). And had a small incident with the cornstarch that was almost laughable. That stuff is hard to control! But I must agree with Pup, Kevin, and everyone else who told me this was good.... it really tasted awesome. Maybe it was also the taste of relief from being finished cooking! haha :) Thanks to Tyler for helping clean up my messes! Omg, those are all so beautiful! Love your reviews Emily! You are so inspiring. And that Flamenco color is amazing! I might have to go pick that one up, immediately. I recreated your look you posted a few weeks back at the most, where you used the Tiffany D palette and Revlon's Cherry Tart since I have both&I love it! Beautiful!!!!! Omg I need these! I am in love with this whole line!!!! I do not own all of them but little by little I've been buying them. So far I own Fruit Punch, Plumrose, Sweet Nectar and Uptown Mauve! Apparently Sweet Nectar is a dead on dupe for MAC's Morange and Milani's Rose Hip is a dupe for MAC's Show Orchard. Your mom had a great idea! I heard an idea similar to that from LoveMelisaMichelle on YouTube. She said to mix your daily moisturizer with MAC's pro longwear concealer on your hand, then blend all over your face. LOVE! I have to agree with Goldiestarling that the frost shade reminds me of the 80's. My sister in law always wore a shade like that. I love the Fuchsia for brunettes! I think I will buy that one and the matte pink or Fruit Punch. You did a fantastic job of reviewing these lipsticks! Thanks for all your hard work. These look great. I think the pinks are my favorite out of the line. Now I have to go hunt these down.. I really love pink frost, flamingo pose, and fruit punch! I love how you reviewed them and showed them on your lips it was super helpful! Really love Flamingo Rose and Hot Pink Rage! Ok why does every single color look amazing on you? If I tried any of those they'd look ridiculous! You are making me long for some of these shades! They are just beautiful. Wow! Love all the colors! So vibrant and rich! I agree that seeing the color on lips is soooo much better than the hand. I agree with wanting to see your mom again soon. The packaging is gorgeous! Thanks for the thorough review and pic of each color. I think my fav is the Flamingo Pose, and it would look fabulous with a brown eye look like you have in the picture. Ok, these are my favorite (big surprise). I think Fruit Punch may even be the same as their Fruit Punch gloss that I love. That would be great! Saw a few that I'll have to try out for sure. Thank you so much for showing them, and they looked great on you! I absolutely love the colors of these lipsticks and can not wait to rock them for summer (or now, lets be honest) but has anyone had any problem with them feathering alot? maybe just wearing a lip liner will solve this problem but I was a little disappointed, maybe I just need to work with them a little more! Love your blog Emily!! I would have to say that the flirty fuschia is absolutely the best colour for you from the pinks. With your hair and skintone you are flattered greatly with darker colours, not everyone can be as fortunate. Its just my opinion but overall i think they are much more flattering than the pinks. Great posts with all the colours, realy see what they look like between this and yesterday. I wanted to mention I recently got a 4 colour sample of Clarins new kipsticks Rouge Eclat, they have the most fantastic colour and emollient feeling it is rare for me to be so drawn to lipsticks but I must have a couple of these as I know they will be ones I finish the tube! Try them out if you get the chance! I really love flamingo pose and plan on buying it soon! I went right out and bought Flamingo Pose because it looks like such a beautiful rosy coral on Emily, but, whoa! These lipsticks are super pigmented! Unfortunately, this color didn't work for me so I am going back to get Flirty Fuschia and see if that's better on my skin. All these shades are just too pretty! I'm kind of regretting reading your review now, Emily.... because I might just go and buy all the lipsticks you just reviewed in this post! eek! Thanks for the great swatches and review! Those swatches are incredible! And I love the photo of the stacked lipsticks! Flamingo pose is absolutely beautiful! I must get one soon! 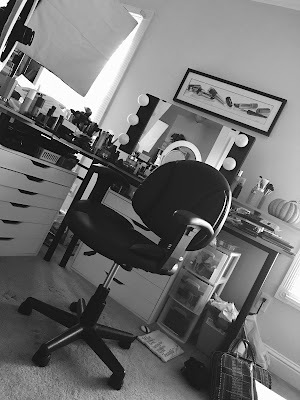 I love reading your blog posts and your videos--they're always so detailed and informative! I also love your food-related vlogs; please make more! This might sound random but I'm Korean-American so I always wondered if you've ever eaten Korean food? I recently started my own Korean food youtube channel, EasyKoreanFood, and it would be so amazing if my favorite beauty guru visited it! I think you and your hubby would love Korean food hehe. I'm such a big fan of your channel and you inspire me to play with makeup and feel great about myself so thank you Emily!!! Thank you for including your full face in the pics. I think that really makes a difference when seeing the colors. Great post!! Love all the pinks! I wasn't as excited about the reds, since I already have several that I adore, but these look amazing. Are any of them similar to Mac colors? I don't want to end up with dupes. Okay, I gotta know, how did you keep the area around your mouth so pristine after swatching so many colors? Really, this is something I'd like to know because when I want to change my lipstick color to another it's a mess. Get rid unwanted expression lines in15 min. For more info log on to http://www.botoxcosmetic.co.in or call 1800-266-67-68.
went hunting and picked me up flamingo pose.. my spring lippy!! thanks emily! Documents, so it spends some time to download. vivavideodownload securely with your family members & good.